Show your support of independent music with this brand new SCI Fidelity 15th Anniversary T-shirt! Plus, get 15% off all items in our online store! 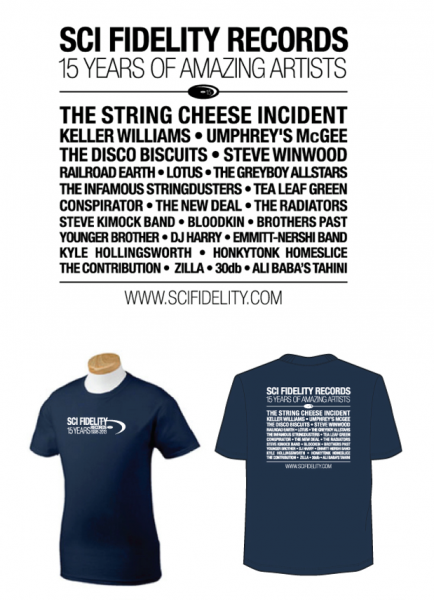 Since its formation in 1998, SCI Fidelity Records has delivered on its mission to support independent artists everywhere, releasing over 75 albums from SCI, Keller Williams, Umphrey’s McGee, The Disco Biscuits, Steve Winwood, Lotus, Railroad Earth and many more, who are all represented on this limited edition shirt. As we celebrate our 15th anniversary as an independent record label, we wanted to extend a thank you to our fans. For the entire month of December, every item in our online store is 15% OFF regular price. That’s every CD, Vinyl, DVD, & Download – all on sale! BONUS: We’ve knocked $5 OFF all vinyl records too, all month long! Enter the promo code “SCIFI15” on the homepage to enable the 15% discount.